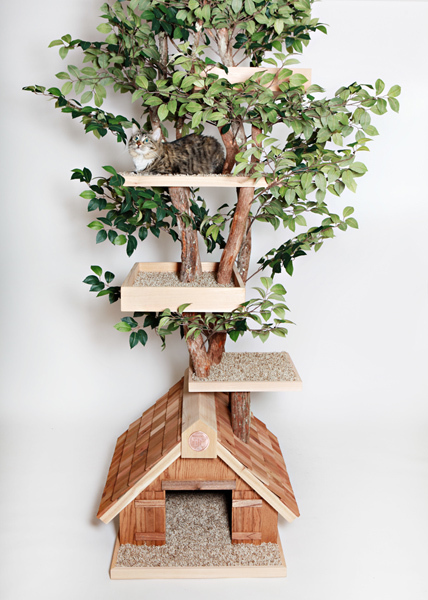 Unlike any pet house you have seen before.Pet Tree House. Let your curious cats climb 7 feet high on this hand-crafted luxury Tree House. This Tree House is custom made making it one of a kind. 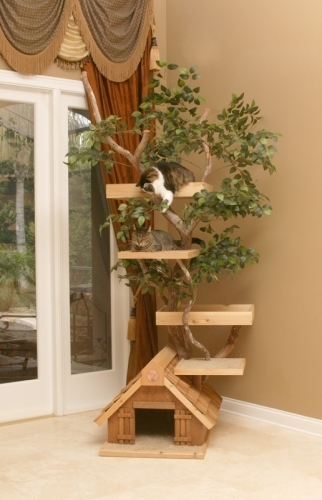 The Mature (large) Tree House is perfect for multiple cats or your special cat that likes to explore. 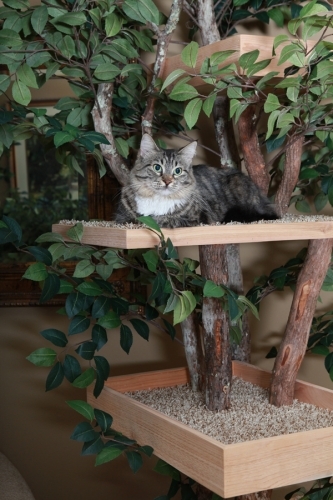 This Tree House gives your felines the room to play, jump, explore and sleep. 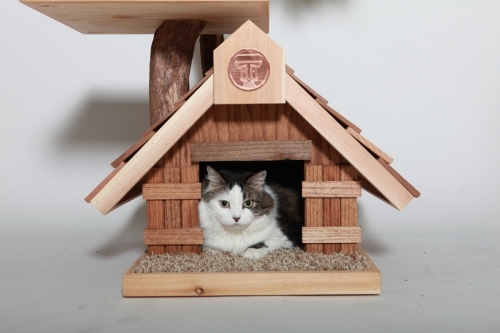 Crafted of wood, cedar, plush carpeting and synthetic silk leaves, this house brings out the kitten in your cat. It features removable carpet for ease of care. * Movement, rustling and flexibility when your cat climbs; brings out their natural animal instinct of curiosity. Not only is Tree House a durable interactive play center for your cats, it is stylish and beautifully constructed blending in with your home while bringing out your cats' true nature. Shipping $275.00 in the 48 contiguous United States. Upgrade to White Glove Delivery for an additional $50.00. Visit the upgrades tab to add this to your order. We recommend two people be home to accept delivery if you do normal shipping. The box is very large. Otherwise, we encourage you to add white glove delivery for $50 so the Tree is brought into your home for you. *Pet Tree Houses are real trees and are for indoor use only. They are susceptible to humidity and must me kept in a climate controlled environment. Expect a small amount of movement in the Tree as it adapts to its new home. Large House w/square entry door 33" x 25" x 22"
Tree House Medallion personalized engraving available for additional charge - visit the upgrades tab to add this to your order. Each Tree is hand crafted to order. Please allow 10-12 weeks until your Tree is ready to ship. Consider adding additional foliage or paw ports. Visit the upgrades tab to see a whole list of available add ons. This Tree House comes fully assembled with the exception of the leaves. There will be colored pegs marking where to insert the leaves. Each Tree is hand crafted to order. Please allow 10-12 weeks for the "growing" of your tree before it is shipped. Product Dimensions: 32" x 32" x 84"
Since each Tree House is custom made to order, all sales are final.